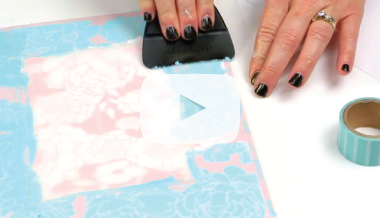 Home / VIDEO LIBRARY / MIXED MEDIA VIDEO LIBRARY"
How to quickly add patterns to paper surfaces using stencils and my new metallic texture paste! Customize your Gallery Wall Frame Mat easily! Now exclusive and available at Michaels Stores! Create an art journal page with my Texture Paste and Color Shine! It takes no time at all to customize a banner with art screen ink! Now exclusive and available at Michaels Stores! 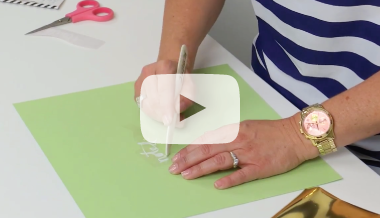 Heidi demonstrates how easy it is to use her metallic texture paste with stencils by creating a quick card! 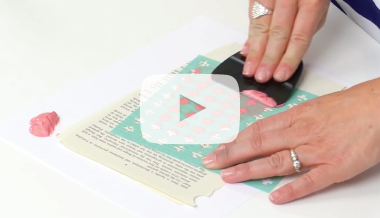 My foil transfer kits are simple and easy to use! Get quick foil effects in 2 easy steps.